Modern life is often characterised as cold and uncompromising. But last week, about 100 bystanders acted entirely against the stereotype. It's the latest in a series of events which challenges assumptions about apathy. It is an unremarkable place for something remarkable to happen. The junction of Hoe Street and Church Hill in Walthamstow, east London, echoes almost any UK high street. There's a Subway, a newsagent, a couple of estate agents, an optician. But last Thursday an otherwise mundane rush-hour was interrupted by a horrible sound. A crunch, a smash, a pop, a bang. People have described the noise in different ways, but all of a sudden the scattered attention of almost everyone in the vicinity was focused. Moments earlier, Zoheb Ishfaq had been sitting in his car with his family, aware that he was already running late for a wedding. He was approaching the traffic lights, coming up the gentle hill from Walthamstow Central station. To his left there was a paved area for pedestrians leading towards a market and a 99p store. Rather confusingly, cars can also drive down there. On the corner there's a restaurant with outside seating. Three cars ahead of Zoheb, just before 6pm, a red double-decker bus - the 212 - was preparing to turn right, past a concrete clock tower, barely a few stops into its route towards Chingford. That's when Zoheb noticed a dreadlocked man on a unicycle - circus performer Anthony Shields - crossing from the semi-pedestrianised street to his left. "Then he went behind the bus and came round so he was on the right of it, on the inside behind the driver's window." Zoheb remarked to his wife that the unicyclist looked like he was wobbling a bit. The road splits into two lanes at that point, so Zoheb, heading north, passed by on the left. And that's when he heard the "pop". "With that remark still fresh in my head, I immediately asked, 'Where's the unicyclist gone?'" Robin Jerrom and Alex Sophocleous were on the opposite side of the bus, sitting in their estate agents' office. Churchill Estates is perched right on the corner, directly facing the junction at an angle. Alex could see the stricken unicyclist from his desk. With their office just yards from the incident, Robin and Alex sprinted out in seconds. They are fairly sure they were first on the scene. "As we were running up to the bus, the driver was trying to look out of the window, a bit confused," Alex recalls. But apparently unaware of exactly what had happened, the driver edged forward. It was a potentially disastrous move. "Because of the way [the unicyclist] was lying, he's gone up his leg, from his calf up to the back of the thigh," Robin says. "I just remember running in front of the bus slamming on the windscreen to stop," Alex says, "and that caused him to reverse a little bit." But the bus was still on Shields's leg. "We were just screaming to roll back or reverse ever so slightly and he was getting all flustered." Alex dashed inside to call an ambulance. Zoheb, meanwhile, had stopped his car almost instantly and within seconds had joined the frantic scene unfolding. Several people were there by now, all shouting instructions at the driver. "I think he panicked, he was almost in tears by the end of it," says Alex. Zoheb thinks he may have been in shock. "Everybody was yelling at him," he adds, "you couldn't even make out what was being said, although the majority of people were trying to get him to move back." It soon became clear to the gathering crowd that something else needed to be done. "That image I have of the guy squirming - it was at that point I realised 'Don't bother [involving the driver]'," Zoheb recalls. The bystanders in Walthamstow acted quickly. Robin admits his first instinct was "Leave it, don't move anything, don't do more damage" - not unreasonable for people with no medical experience. "If someone's been impaled with something, if the skin's been penetrated, and you pull out, you could do more damage," he says. "If it had been anything other than his leg trapped it might have been different." Zoheb agrees it was relatively clear what needed to be done. "There wasn't much blood and the thought of waiting another five minutes, while the whole weight of a bus and its people putting pressure on him, was like a trigger - it looked like the most reasonable action to take." But moving a bus is not easy. A typical double-decker weighs 12 tonnes. Empty. And this was during rush hour. "A few of us - like three to five - quickly just tried to futilely grab the bus near the wheel arch, which is where the guy was, and lift it up," Zoheb says. "There was no chance we could do it, it was more an invitation for other people to help, really, that's how I saw it." By this point the crowd had grown to about 40 or 50. Diners had dashed from nearby restaurants. Customers had rushed from various shops. Student Kyra Sam had been on her way to buy food at the market. Estate agent David Miller, from Haart, had just walked back into the office after an evaluation when the crash happened. The surrounding scene was chaotic, Robin says. David could hear children and women crying. Kyra recalls people holding their hands to their mouths. "A lot of people were screaming, a lot were in shock," she says. With so many strangers suddenly and rapidly trying to work together, it's difficult to discern how much coordination there was. But at the very least, some kind of collective understanding of what they were trying to achieve began to develop. "[It was] almost like working towards a mutual goal but unknowingly, without actually communicating it across," Zoheb says. At first there wasn't much luck. "The most I felt was a wobble, I probably did more damage to myself." David had arrived shortly after the first few people. He says he wasn't even aware of how many people had joined in the effort until he saw the video much later. All he noticed were "more and more hands appearing above and below mine" on the bus. But there are only so many hands that can crowd around to help. It created a sort of two-tier group of bystanders. Kyra was in one of them. "I did run over but I didn't lift the bus," she says. "There were so many people doing it already and it was [almost] all men so I thought I'd leave them to it. I didn't want to interfere." It's not an easy position to be in. "Your instinct is to go over and I wanted to see if I could help in some way even if I can't lift the bus," she says. "You do feel a bit helpless having to stand back and watch because you don't feel like you're doing any good." A few others inevitably reached for their phones - although most were then subjected to a form of group self-policing. "A couple of people were saying 'Don't film it! Don't film it!'" Kyra says. "Nowadays you really think 'Oh, shall I video it? '," but thankfully most people felt it wasn't appropriate, she adds. "Anybody who did video got shouted at anyway." As the seconds ticked by, co-ordination developed. Some remember "three, two, one" countdowns. Others remember shouts like "heave" or "come on". Zoheb swears he heard "Code Red". "That stood out," he says, "I remember [because] I was a bit baffled but there were loads of people saying it." Most agree that the main co-operation was largely unspoken. From initially trying to lift the bus, Zoheb realised that most people had begun to push or tilt it instead, and followed suit. David, who was at the wheel arch and says they'd managed to lift it about a foot upwards. The problem was that the suspension meant that the wheel itself still hadn't moved off the ground. At one point David looked up. To his astonishment there were still people on the bus, apparently unaware. "A few of us started shouting for them to get off," he says. A double-decker bus is hard enough to shift without passengers, and emptying it seems to have made the crucial difference. Suddenly the wheel lifted about six inches off the ground, David says. 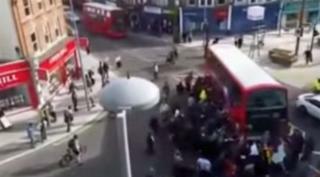 The bus shifted slightly sideways and someone next to him grabbed the victim and dragged him out. But some accounts differ, with Anthony Shields actually crawling out himself. "There was a point where, once we had got him free," Zoheb says, "his dreads were still under the wheel, and he managed to pull them out himself. So if he was conscious and strong enough to do that still, I saw that as something promising." The whole episode, which had drawn in bystanders from all around, was over in just a few minutes. But having released him, there was little elation and they began to disperse. The gravity of the situation was still clear. The victim was in severe pain, despite being comforted by a female bystander. "The positioning and posture you could see from his body didn't look good at all," Zoheb says. Fortunately, first the police and later the ambulance soon arrived, all within a few minutes. Eventually he was taken to hospital, where he remains in a serious but stable condition at the time of writing. Examples of spontaneous life-saving collaboration among strangers are rare. People in a crowd often don't quite know what they should do next. It's one of the reasons bystanders often do nothing, says Dr Mark Levine, professor of social psychology at Exeter University. The classic case study was the murder of Kitty Genovese in New York in 1964. The victim's cries were apparently ignored by several people - the inaction allowed the killer time to leave and return. "The 'bystander effect' is probably one of the most reproduced findings in social psychology," Levine says. "That the presence of others can inhibit you from helping." It's not always the case. In August 2014, a man slipped and caught his leg in between a train and the platform in Australia. His fellow passengers then combined their strength to tilt the train and free him. On that occasion, the rescue effort was believed to have been co-ordinated by staff. A similar situation happened in April in Russia, when Moscow commuters helped to save a trapped 70-year-old pensioner. In both instances, crowds acted positively and resolved a situation. But the shocking video of a Chinese toddler ignored by passers-by after a hit-and-run in 2011 is at the other end of the spectrum - sparking criticism of fatal apathy. The key to positive group behaviour and intervention, Levine explains, "is building a sense of shared identity". In such a scenario, someone's mind flicks through numerous calculations almost instantaneously, he says. Is this dangerous to me? If I intervene, can I actually help? Will others support me if I do this, or will I be embarrassing myself in some way? What's my responsibility to the victim? Action often has to be decided quickly, Levine says. "The longer you leave [it], the harder it is to make a decision. If you don't immediately act then you kind of think 'Well, actually I probably couldn't have done anything anyway'." But the fact that people had started on the bus made it easier for other bystanders to join, Levine says. It was obvious that their help was required to move the bus, making their internal calculations easier. The people in Walthamstow did act. And the effort made its mark on those who were there, as well as many of those who helped the story go viral. "It was really overpowering to see because I've never seen anything like that," Kyra says. "Everybody without hesitation went to help, they didn't care about [their] health and safety." "As horrific as this situation was," Zoheb said to his wife shortly afterwards, "I've never seen such instant co-operation based on a mutual good." "I've lived here my whole life [in London], my mum's born and bred here too, and it comes across as quite a cold, careless city. I've seen things happen and people don't pay attention, it's like everyone's too scared to defend someone or to help and that's always angered me. "That was part of the shock factor. I expected people trying to help but I would assume that people just said let's wait for the ambulance to get here and follow the usual protocol." Once the authorities did arrive, people began to disperse. Zoheb, whose car was still blocking the road, eventually drove off to the wedding. "Why are you late?" everyone kept asking. "Last year I was reunited with the man who stopped me from taking my own life. It had been six years since I travelled to a bridge in central London with the intention of jumping off..."